With nearly 80% of businesses experiencing four or more disruptions to their site each month, Aberdeen Group recently conducted a study to get to the root of today's internet performance challenges. Are your online services and sites built for resiliency or destined for the headlines? 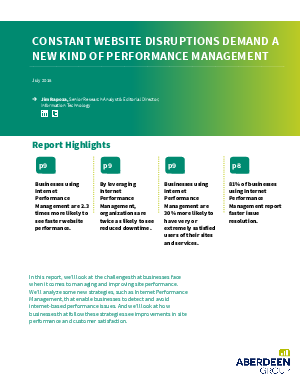 Get the report to find out how leading organizations are bucking the stats and implementing Internet Performance Management (IPM ) tools to boost time to resolution and improve site performance.